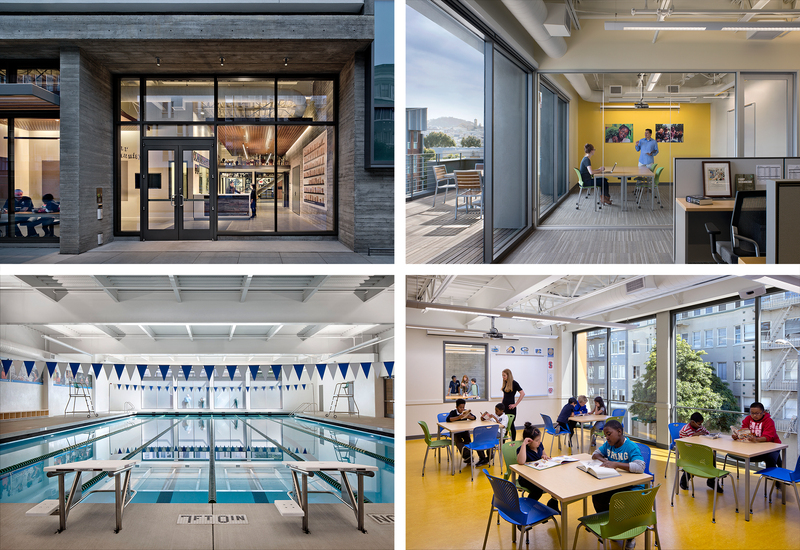 The Boys and Girls Club opened its new Don Fisher Clubhouse in Hayes Valley this February. On a spot where the Central Freeway once touched down, now kids from the Western Addition, Hayes Valley, and the Tenderloin neighborhoods have a place to swim, play basketball, learn guitar, and get help with their homework. Most of all, they have a refuge in a city that can be a tough place to grow up for the economically disadvantaged. The clubhouse is the realization of a long-time dream. Since the 1950s, the Boys and Girls Club has had a clubhouse in the Haight. But as the city’s population shifted over time, fewer kids lived near enough to make use of it. The Boys and Girls Club began searching for a new site, one that would be closer to the youth it served. But finding a parcel big enough in the city was no easy task. Fortunately, when the Central Freeway was torn down in the wake of the Loma Prieta earthquake, it freed up a number of sites. The city sold one that was being used as a parking lot to the Boys & Girls Club, with the agreement that a portion would be used for housing. Some of our initial design schemes integrated the two uses, placing the clubhouse on the lower floors and housing on the upper floors. But the club ultimately decided it made more sense to separate the two elements and sell half the site to a local developer. From there on, it was like solving a puzzle. The first piece was the master plan. As the master planner for the whole site, we were able to arrange some things to provide mutual benefits. We needed easements to bring light into the clubhouse. So we worked with the developer and their architect, David Baker Architects, who agreed to create a landscaped courtyard alongside the clubhouse so we could have windows. We placed the clubhouse’s dining room along this wall and put in large translucent windows that provide privacy while bringing in daylight. Windows on the third floor are clear to provide views of the landscaping. Both the clubhouse and the housing developments share the same landscape architect, so the landscaping is well coordinated. The housing also shares its stormwater management system with the clubhouse; rainwater falling on the clubhouse roof flows into planters for filtering. The next piece of the puzzle was fitting all the different elements—the gymnasium, the swimming pool, the club program rooms, offices, etc.—into a compact site. We divided the clubhouse into two sections, one with the swimming pool on the ground floor and the gymnasium above it, the other with learning, dining, and support spaces and two floors of administrative offices above. 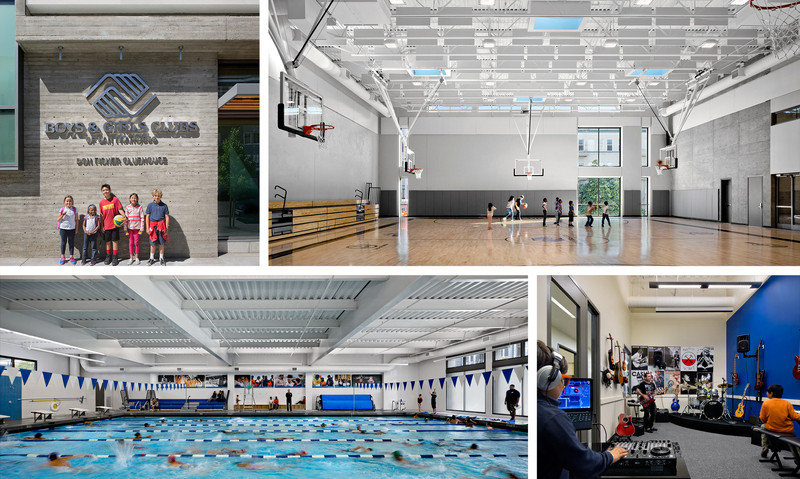 Placing a 70-foot by 100-foot gymnasium above a 70-foot by 100-foot swimming pool was a huge structural and acoustical design challenge all by itself. 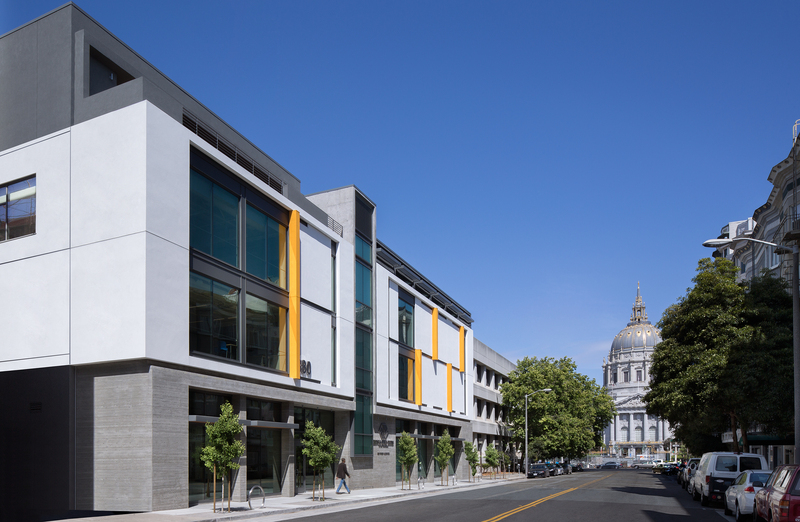 The next challenge was to fit the building into its context in a coherent, neighborly way. There are residential, civic, and institutional buildings in the immediate area. In this case, the right solution was to create a relatively understated design, so as not to compete with the dramatic architecture of City Hall or the two jazzy multifamily buildings designed by David Baker Architects, one across the street and one going up next door. In addition, our client wanted to focus its spending on providing programs for its target audience, underserved youth. Understated doesn’t have to mean dull. Although the clubhouse’s Fulton Street facade uses simple materials—board-formed concrete, stucco, glass, and wood sunscreens—we broke things up into multiple panels to provide a human scale and sense of texture. A few vertical bars of bright yellow recall the color of school buses, reflecting the building’s status as a place where kids develop skills, and helping the structure stand out on foggy days. An interior stairway along Fulton Street divides the two halves; it’s glazed so it glows like a beacon at night. Transparency was a key theme. The building was built around a two-story glazed atrium at the core. Kids are running up and down it all the time. Our idea was that from the atrium, they’d be able to see all the activities the building offers—kids swimming in the pool, running around the gym, or playing guitar in the music room. The atrium makes it easy for them to navigate, and it provides great visibility so they can feel safe. Usually gymnasiums don’t have windows, but we added windows on the street to connect the building with its neighborhood. It’s in the middle of the city, so why not share the activity? On the ground floor, the swimming pool has translucent windows, providing privacy but animating the facade. Above those windows are smaller, transparent windows that are operable, so when you walk by, you won’t see inside. But you might hear the kids splashing around and having a great time.